He may not reach the mandatory retirement age of 75 for another six weeks, but that didn't keep Cardinal Cormac Murphy-O'Connor of Westminster from sending his papers in early... and announcing Rome's response earlier this morning. "[T]he Holy Father has invited me instead to continue in my present pastoral ministry donec aliter provideatur - that is, until he chooses otherwise," the cardinal said in a letter to his priests. "I am very content to accept the Holy Father’s request." 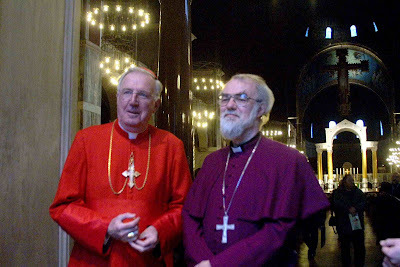 Shown above with his Anglican counterpart, the archbishop of Canterbury Dr Rowan Williams, Murphy-O'Connor succeeded the famed Basil Hume as head of the church in England and Wales in 2000, and received his red hat within months. Dogged for a time by controversy surrounding his handling of clergy accused of abuse during his 26 years as bishop of Arundel and Brighton, he managed to ride out the storm, and has had a notable amount of papal face-time in recent weeks, both accompanying the former Prime Minister Tony Blair on his farewell audience to Benedict XVI, and returning four days later for the secret briefing on the now-released motu proprio for the 1962 Missal. While his northern confrere Cardinal Keith O'Brien of St Andrew's and Edinburgh garnered global headlines some weeks back for holding out the specter of denying the Eucharist to pro-choice Catholic politicians, Murphy-O'Connor was more circumspect in a recent interview with Vatican Radio. Summarizing his experience, the cardinal said he's found that while "people may not agree with the Catholic voice... they accept the right of the Catholic voice to be heard and wouldn't want it not heard." "Catholic politicians have a duty to examine their conscience, to be informed about their faith and to act on that conscience," he said. However, in his view, "how they do so is a decision they make."